This step-by-step guide will show you exactly how to solve even the most annoying Samsung Galaxy phone problems. 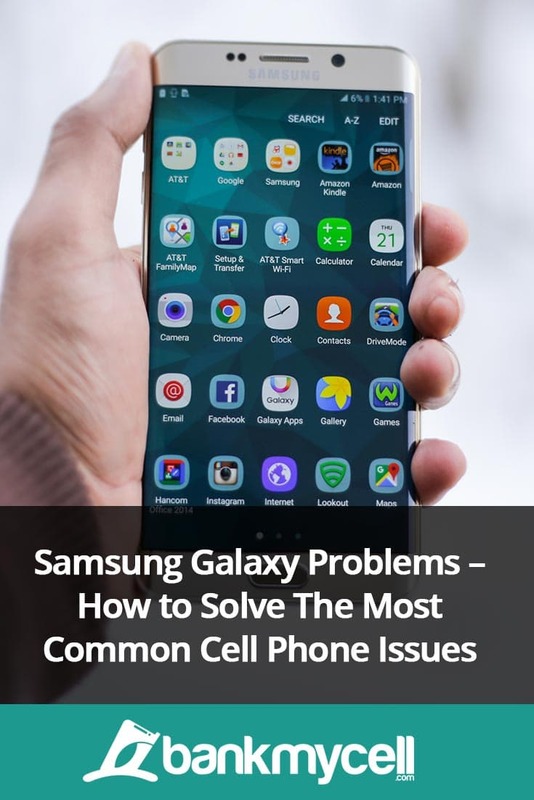 If your Samsung phone won’t turn on, or you’re having cell phone screen problems this Samsung phone troubleshooting guide will give you the answers you need to get your handset back up and running. Don’t get us wrong, the Samsung Galaxy phones are some of the best on the market, but like all technology mishaps happen! If your phone won’t turn on, don’t panic yet. First try plugging in your phone to the charger and wait to see if it revives itself. If charging doesn’t work, it may be an issue with your battery. You can purchase a new galaxy phone battery online on sites like Amazon and eBay for a reasonable price. If replacing the battery still doesn’t work, it may be time to speak to Samsung themselves. If you are having Samsung cell phone screen problems and it has frozen you can first force it to reboot. This means it will force your phone to turn off and on again, but won’t wipe any data. First, ensure your device is charged to at least 5% battery or it may not power back on after the reboot! Then you need to press and hold down both the Volume button and the power button on each side of the phone at the same time. When the reboot is ready, the device will restart! You can also try removing the battery for 10 seconds. Sometimes phone batteries can get hot when charging or when the phone is processing a lot of data – usually this isn’t too much to worry about. Move your handset out of any direct sunlight and place on a cool surface. Disable the use of Live Wallpapers by going to settings, display then wallpaper. Dim your screen brightness by going to settings then display. If you want to make your phone really efficient, you can turn on the auto-brightness. Your phone screen accounts for about 50% of the battery usage, so making sure it is never unnecessarily bright will be a big battery saver. Turn off push email. When your phone is constantly connected to a server to push you emails it drains your Samsung battery and also burns data allowance. You can change the settings so that it ‘fetches’ emails only once every specified time. If you have a galaxy S4 or above, you can head to the power monitor to check which apps are draining the most battery. If you’re not using them, disable them or even uninstall them. Turn of Bluetooth and location services in settings. First try turning the WIFI connection off for ten seconds then back on. To do this go to Apps, Settings, wi-fi, and then OFF/ON. If your wi-fi won’t connect to a personal home network then check there is no issue with the router itself. You could try turning the router on and off, then trying to connect the phone again. If the camera won’t work on your Samsung Galaxy phone, we are guessing you are pretty keen to get it sorted. Luckily there are a few quick fixes for your Samsung galaxy camera which you can try! Sometimes your phone may have just been overloaded with information. Go into settings > applications manager. Here you can ‘Force Stop’ any app you like. Scroll down the camera app and click. Once you’ve ‘force stopped’ it, click Clear Cash and Clear Data. Then, reboot your phone. Let me know any missing issues and tips by leaving a quick comment below right now!